MB & MDR arrived back home yesterday after a two day (1 night) stopover in Hong Kong. The flight from London to HK was approximately 12 hours and the pair arrived relatively rested after being able to sleep most of the overnight flight (even though the pair were travelling cattle class). Not long after checking into the Holiday Inn Express at Causeway Bay it was dinnertime, so it was off to PB's fave Chinese and true to his promise the food was excellent. Also visited Soho and checked out the Bhatti Bar, where they make a great Pina Colada. The following day the trio visited the Panda bears at Ocean Park. 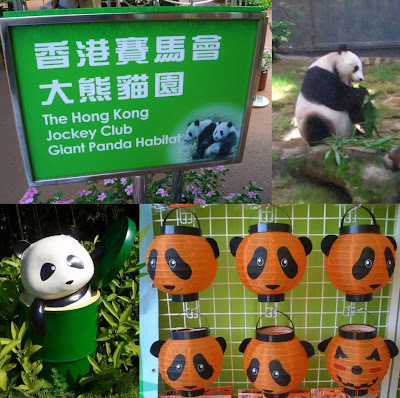 There are now 4 Pandas resident here in upgraded and air-conditioned enclosures. Two of the Pandas were up and about and MB as always was completely beguiled. Ocean Park was spruiking Halloween bigtime with halloween merchandise everywhere as well as the usual props such as monsters, pumpkins etc. Unfortunately they'd also managed to find some "scary" synthesised halloween music which was blaring from multiple speakers, the maximum distance between each speaker could not have been more than 3m, ensuring blanket coverage throughout the park. Peace broke out in the cable car though, thank God no speakers in them. They're probably working on rectifying this omission though. After building up an appetite at Ocean Park PB again proved himself to be the ultimate host and took the pair to his favourite Sushi joint, Sushi Sumi, for another super meal. MDR was ready for a nap by then so MB went off for some retail therapy. Loads of excellent shopping all around the Holiday Inn. After an evening dim sum meal at the IFC Mall above the Hong Kong MTR station, the pair took the airport express back to HK airport for their overnight, direct, flight back to Cairns. This is a pretty short flight, around 7 hours, but neither MB nor MDR slept much so both arrived home absolutely wasted. It is however great to be home after 6 weeks away. I see you still have the London clock on the blog, are you still running on London time?